To begin with a disclaimer. This post contains information related to the new EU GDPR regulations that comes into effect on the 25 May 2018 which might be of interest to Google Apps Script and Add-on developers. I’m not a Google employee, lawyer, or a data protection expert and I’m only sharing my interpretation of information I’ve gathered for your consideration and is not legal advice. As this is a complex area the post is in two parts. This part is the second in the series. In part one I looked at key definitions to help you identify if your G Suite Add-on or Google Apps Script project needs to consider personal data protection. If from that post you concluded your add-on or Apps Script project needs to add personal data protection this post identifies 12 steps you can take now. This post was also written with Steve Webster G Suite Senior Solutions Architect and Developer at SW gApps (also not a Google employee, lawyer, or a data protection expert). In the previous post I looked how GDPR provides “data protection and privacy for all individuals within the European Union” including data from EU citizens even if it is used outside the EU. One option is to avoid the GDPR by preventing EU citizens using it. You could do this by selecting the regions when you publish your add-on. One issue with this is not all EU countries are individually listed (Croatia, Republic of Cyprus, Latvia, Luxembourg, Malta and Slovenia are not listed). I’m not sure if for example you just selected ‘United States’ this would prevent all EU citizens accessing your add-on. Another consideration is if you are updating publication settings for an existing add-on, does this prevent existing users from the EU from continuing to use your add-on? Another option if you use personal data in your add-on is to use the GDPR as an opportunity to improve your data handling and transparency. A number of services based outside the EU have incorporated aspects of the GDPR in their privacy policies and working practices. Hopefully this post is proving a useful starting point. For the majority of add-ons I’d imagine the personal data is limited so this should take too long. For EU based developers this is something you should consider doing for your entire company. In an add-on you may discover you need to handle lawful basis for the different types of personal data you use. For example, if you include Google Analytics or another tracking service to monitor your add-on usage you will probably require consent from the user, but if you have premium options in your add-on you may use a contract as lawful basis. ‘Legitimate interests’ can be conveyed in your user privacy notice and might be well suited to add-ons as you could argue that by installing and using the add-on there is reasonable expectation and compelling benefits. Using ‘legitimate interests’ comes with extra responsibilities including conducting and recording a legitimate interests assessment (LIA). If using consent as a lawful basis for processing personal data you need to keep a record on an individual basis. The UK ICO note that “consent requires a positive opt-in. Don’t use pre-ticked boxes or any other method of default consent”. 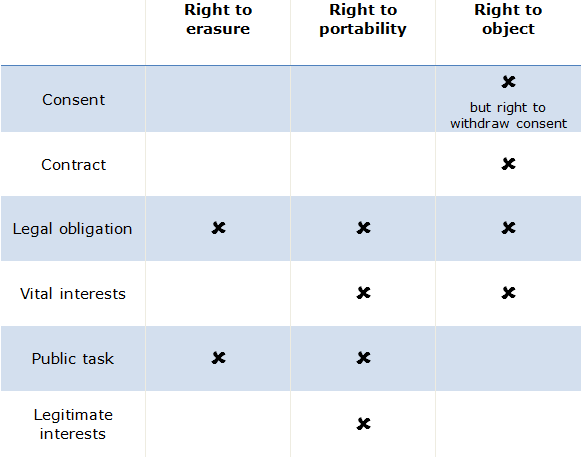 the right to data portability is new. It only applies: to personal data an individual has provided to a controller; where the processing is based on the individual’s consent or for the performance of a contract; and when processing is carried out by automated means. This might be particularly important if you are developing add-ons for education. It appears breaches should be reported to the appropriate authority in your jurisdiction. As knowing who this is isn’t always straightforward to find out you should have this documented. For US based developers here is a Summary of U.S. State Data Breach Notification Statutes (the 72 hour window applies to EU citizens data, you may discover your jurisdiction has additional requirements). Additionally for add-on breaches you might want to contact Google directly. A contact address list on Google’s Privacy Shield is [email protected]. At the heart of this is having in place the appropriate workflows and policies. Having documented workflows is useful as doing Data Protection Impact Assessments are not always required. If you are the sole developer this will be easy… Depending on the circumstances, including the country you are based in, you might have to formally register a data protection officer. In the case of the UK the ICO has a self-assessment tool. The European Commission has so far recognised Andorra, Argentina, Canada (commercial organisations), Faroe Islands, Guernsey, Israel, Isle of Man, Jersey, New Zealand, Switzerland, Uruguay and the US (limited to the Privacy Shield framework) as providing adequate protection. Adequacy talks are ongoing with Japan and South Korea. In the case of transfers to the US this is on a company rather than country basis under the EU-US and Swiss-US Privacy Shield framework. Google is certified under the Privacy Shield so personal data on Google’s infrastructure should have the adequate level of protection. A consideration for developers is if your add-on sends personal data to other non-Google services is whether those services are in recognised countries or have been certified under the Privacy Shield. Hopefully this post has highlighted some actionable steps you can take now. In writing this post both myself and Steve contacted Google asking for clarification for add-on developers. Unfortunately there has been no comment from Google, but you can learn more about how Google is committed to GDPR compliance across G Suite and Google Cloud Platform services. The GDPR is a big topic but sites like the UK’s Information Commissioner’s Office (ICO) have lots of useful resources to help with the GDPR. To the question “Another consideration is if you are updating publication settings for an existing add-on, does this prevent existing users from the EU from continuing to use your add-on?”, I believe the answer is, no. Hi, thanks for the big revue. ..is Google Sheet enough safe to respect security asked by GPDR ? Previous Post: GDPR compliance in Google Apps Script and G Suite Add-ons: Should you be concerned?